Bringing Back 19th Century Decorative Arts, the Anticipated Stamp and Impressionism in Barnebys Top Auction Picks this week. The Unique British Guiana 1856 One-Cent, Black on Magenta Surface-Colored Paper (Stanley Gibbons no.23, Scott no.13). The most exicitng auction this week is that of a fairly modest sized object with a history that is larger than life. 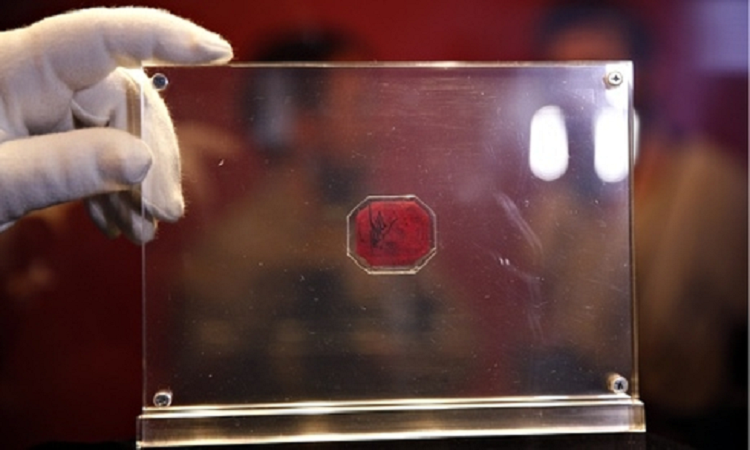 The auction of the only surviving example of a legendary stamp that sold for one cent back in 1856. The stamp was owned by an American millionaire John DuPont, who died four years ago whilst in prison. It is an emergency stamp which was printed by the local Official Gazette newspaper in British Guiana, when storms meant the postmaster was in danger of running out of stamps. The British Guiana one-cent magenta is estimated to sell for $20 million. If it reaches this estimate it will set a new record for a single stamp. See more stamps on Barnebys here. 190 lots of 19th century European Art and Old Master's will be on sale at Freeman's on Tuesday. Drawings, oil paintings, etchings and some water color. There are gems in the sale such as Montague Dawson (British 1890-1973) White Squall - Clipper Ship Ann McKim estimated at $40,000-60,000. 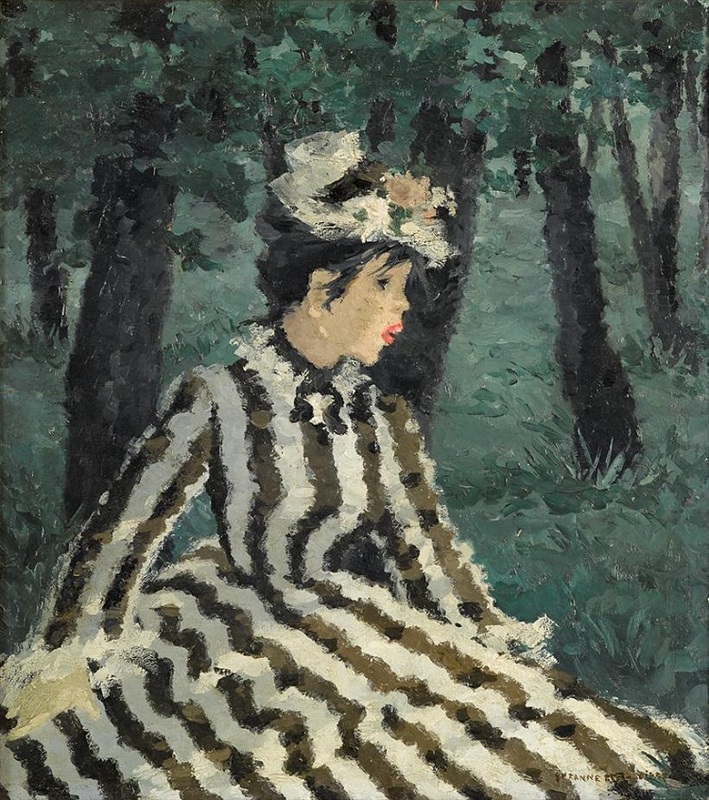 A couple other interesting pieces in the sale an oil on canvas by Suzanne Eisendieck (French 1908-1998) Woman in a Landscape, painted in an impressionist style. The intriguing piece pictures a melancholy or pensive woman sitting in the grass, gazing out of the picture frame. With an estimate of only $1200-1800. With the same estimate the Rembrandt Van Rijn (Dutch, 1606-1669) etching Adoration of the Shepherds: A Night Piece (ca. 1652) is a smoky depiction of the biblical scene of Jesus birth. See more Freeman's on Barneby's here. A small jardinière and calling card container with glass liners and gilt mounts. Height: 6 cm, 4,5 cm, Length: 14 cm, 10 cm. Le Corbusier, Gregor Paulsson and Jane Jacobs, naturally we appreciate the hard-work of the modernists, in terms of archtitecture, design and urban planning but it is dull that it rendered most of the more opulent late 19th century decorative arts obselete. Much of what the modernists critizie is what we enjoy about many of the late 19th century glass och porcelain objects on sale at Dorotheum. A mixture of styles and the fruits of early mass-production for example are a thrill to decipher. 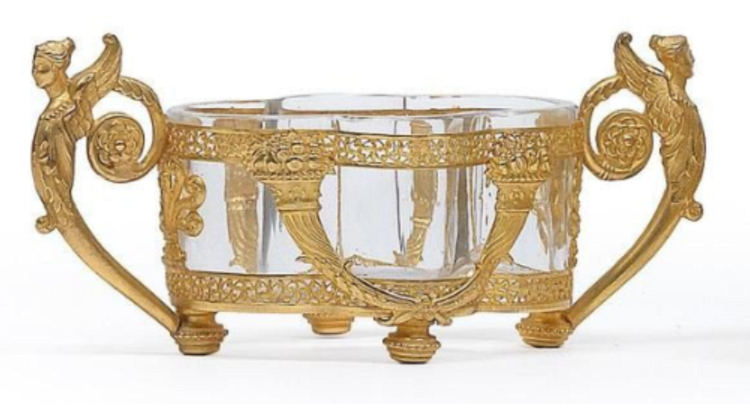 A prine example is the French Jardiniére or Calling Card Holder of quatrefoil- and rectangular form, the yellow metal body with delicate open-work leaf borders and acanthus friezes, each with 2 cornucopias with fruit and handles with winged female figures, 4 disc feet and the facing side with winged sphinxes, medallion and laurel branches, flanked by dancing ladies with floral garlands, estimated at €500-700. The sale features items from the medieval period up until the 19th century. See more Dorotheum on Barneby's here.